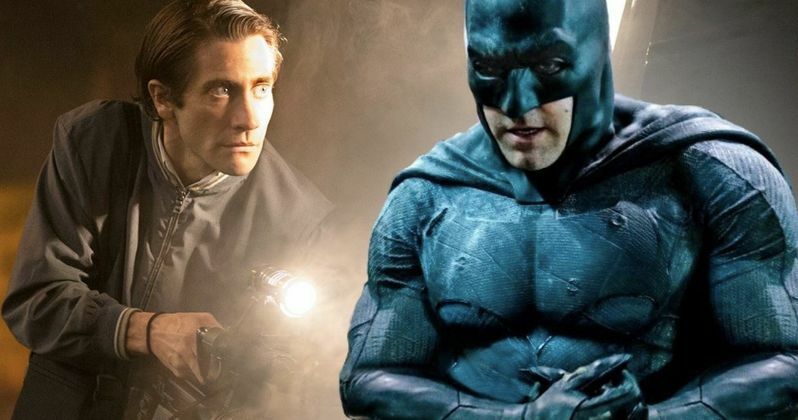 A new report suggest that Jake Gyllenhaal is really interested in playing the Caped Crusader in Matt Reeves' The Batman, but Warner Bros. isn't super into the idea. The news comes after a rumor started to circulate that Gyllenhaal and Reeves were in talks about the role a few weeks ago in the event that Ben Affleck doesn't return. It's been widely reported that Ben Affleck won't be returning to play Bruce Wayne again and is rumored to publicly split from The Batman after the Justice League promotional tour ends. The new report comes from Reddit, so it's best to approach this news like it was Joker, naked, in a dark alleyway offering you a coke with no ice in a bottle at midnight. The new report suggests that talking to other actors was a tactic to try and rope Ben Affleck into more movies, but the most interesting tidbit says that Jake Gyllenhaal is really into the idea of playing Batman. But Warner Bros. is unsure of the actor taking on the role. The source claims to be close to Warner Bros. and says that Matt Reeves intends to keep his projected release date. The source had this to say. "Matt Reeves hopes to have the film out by 2020. Plot details remain under wraps but Matt has indeed met with other people about replacing Affleck. Initially it was just a tactic to get Affleck to sign on for more films, but then when that didn't work, it got through to the studio that Affleck really didn't want to stay. Gyllenhaal really wants the role, but the studio isn't 100% sold on the idea yet. They might use Flashpoint to make him younger, but I don't know how that will work." If this new round of DC leaks is to be taken seriously, Jake Gyllenhaal might have a ways to go before he is able to prove that he the right man for the job. While Gyllenhall is reportedly excited for the part, he's allegedly not the studio's first choice. It's also being reported that Matt Reeves has "met with other people," suggesting that there are several potential Bruce Waynes being considered at this time. However, what this rumor rules out, is the chance that Ben Affleck will remain on board for The Batman, which has been reported for months. Neither Reeves nor Affleck has said anything definitively either way about Affleck's future as the Dark Knight. Jake Gyllenhaal was originally up for the part of Batman in Christopher Nolan's Dark Knight trilogy, but the part ultimately went to Christian Bale. The idea of Gyllenhaal getting a second chance is an interesting one and it might be part of the reason that Warner Bros. is unsure to move forward with him. From artist mockups, Gyllenhaal looks like he could pull off the part and he certainly has the acting chops to pull off an intense Bruce Wayne, but he may not get the second chance. It's important to note that this is an unconfirmed rumor at this time. Even so, it's a pretty detailed rumor that goes along with all of the other reports that have been floating around the web lately. The big take from this report is that it seems Ben Affleck is the one responsible for not wanting to come back and put on the cowl, not the studio. At this time, it seems like the hunt for the new Batman is ongoing and may or may not result in Jake Gyllenhaal jumping into a highly coveted role. You can read that report along with some more DCEU leaks courtesy of Reddit.